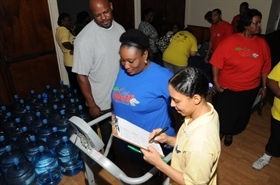 At their first weigh-in forty participants in the National Insurance Board’s Get Well Bahamas Health and Fitness Challenge, lost a total of 289.7 pounds in the first two weeks of the programme. This represents 2.37 percent of their total starting weigh, setting them well on the road to improved health. “We’re very pleased with the progress of our Get Well Challengers. They are highly motivated and committed to the process of behaviour change,” said Jan Martin-Isaacs, president of Jemi Health and Wellness, administrators for the groundbreaking programme. Get Well Bahamas, a signature pilot programme of the National Prescription Drug Plan’s Healthy People Programme was officially launched on January 31, 2011 to help Bahamians combat obesity and lifestyle related chronic conditions including diabetes, hypertension, high cholesterol and ischaemic heart disease. Forty participants were selected from over 200 applicants to receive, free-of-charge, 12 weeks of wellness coaching and personal fitness training from local experts Jemi Health & Wellness and Body Zone Fitness. According to Mrs. Martin-Isaacs the first two weeks of the Challenge focused on getting participants to cleanse their systems by eating only fruits and vegetables in the first week (with some modifications for diabetics), increasing their daily water intake and then re-introducing lean meats by the second week. “If you’re going to build a house, you first have to clear down the property,” Mrs. Isaacs explained. Additionally, she said the Get Well Challengers were given pedometers at the outset and encouraged to get moving by walking more and measuring the number of steps walked daily. In the first two weeks the forty participants lost an average of 7.25 pounds per person with some Challengers registering weight loss in double digits. Melissa Lesbott, a 29 year old Challenger who has both diabetes and hypertension said she was very pleased with her results. “I have to admit the first week was hard for the most part… but it seems as though everybody made it through and we’re still excited about the programme. I’m very excited about how I did,” she said. Ian Lightbourn, a 50 year old businessman with hypertension and high cholesterol said he was thankful for the Challenge and the experience of the first two weeks. “The first week of just detoxing was hard but after I started working out it was different because you were more or less motivated working out and when you got home in the evening your body was tired so you could then more or less relax …now that we’re moving to the next stage it’s getting easier,” he said. He added that he was especially pleased that his children are now eating what he is eating. Another Get Well Challenger Olga Marie Brown, 52, also has high cholesterol. She said her results were much better than she expected. “The programme is working. I’m getting towards my goal. I feel lighter, energized. I can run up my stairs in my house. I can go further. I’m walking now and I can actually bend down and put my stockings on,” she said. At the end of the 12 week progamme Get Well Bahamas will award a number of very attractive prizes to the three most improved participants. Prizes will include an entire year’s supply of Nautilus Water, three one-year gym memberships from Body Zone Fitness, a one year gym membership from Jemi Health and Wellness plus gift certificates for the purchase of healthy foods from Solomon’s Super Center and new clothing from Bonneville Bones, Adam and Eve and Sizes Women’s Full-Figured Fashions. FIRST WEIGH-IN – Get Well Challenger Melissa Russell faces the scale. PROPER PLATING – Get Well Challengers learn how to put together a balanced plate of food. The National Prescription Drug Plan was the morning topic on the Ortland H. Bodie radio talkshow on Wednesday September 11, 2013. The Drug Plan was represented by Mrs. Tami Francis, Senior Manager and Dr. Martin Malick, Pharmacist. The National Insurance Board and the National Prescription Drug Plan congratulates the winners and all challengers who participated in Phase 3 of Get Well Bahamas. Get Well Bahamas challengers competing in the Great Pedometer Step Off on the Paradise Island Bridge.